Tonight we received a fun email from a concerned public relations director of The Grand Brony Gala. We have provided all the information provided to us, and even censored parts of it, because we're nice guys. Ohhh [REDACTED], you made our night. Good evening. Please allow me to introduce myself. My name is [REDACTED], and I am a new staff member with The Grand Brony Gala. I’m handling marketing and PR for all their events leading up to the convention in July of 2015. I just started, but I’ve had to hit the ground running, as we have an event scheduled for November 14th. It’s called the “Once Upon A Night Mare Masquerade” and is scheduled to take place at the University Area Community Development Center in Tampa. I’ve attached a press release with the particulars. I would be very appreciative if you could post the particulars to your news stream and calendar. I would have submitted the article directly, but your site said go to the “Submit an Article” button on the right and no such button exists. I do have one other concern. We do wish to get the word out about our events, but our event is family friendly, and from my first perusal of your site, it appears to be anything but. It seems as though your staff takes a very aggressive tone in their writing, with frequent use of sarcasm and profanity. Where this concerns me is I’m already dealing with issues of pushback against bronies from the more mainstream media in the region, getting them taken seriously. Part of that is because there is a reputation that bronies are a corruption of what was intended as a children’s show. Your site does appear to give ammunition to their argument. I’m concerned about whether any material I provide you would be handled respectfully, or even simply reported in just a straightforward manner – posted as is without a snarky commentary. I’d be more than willing to discuss this with you, to gain a better understanding of your editorial philosophy, and why you choose this approach. My role with the organization is to provide content to outlets like yours, and help you get info to your followers. As the premiere MLP convention in the Southeast, we are where your Brony and Pegasister readers from this region are going to meet next July. They are going to want to be in Tampa. So finding a way to work together serves us both, and most importantly, serves them. I’d appreciate an e-mail from you to discuss this further. If you’d prefer to contact me directly, my cell phone number is [REDACTED] . Yes, that’s a strange area code, but it’s because I’m a Seattle area transplant. I want to thank you for your time, I know how busy and hectic your schedule must be, and I really appreciate you taking a few moments to look over my materials. Have a wonderful day. 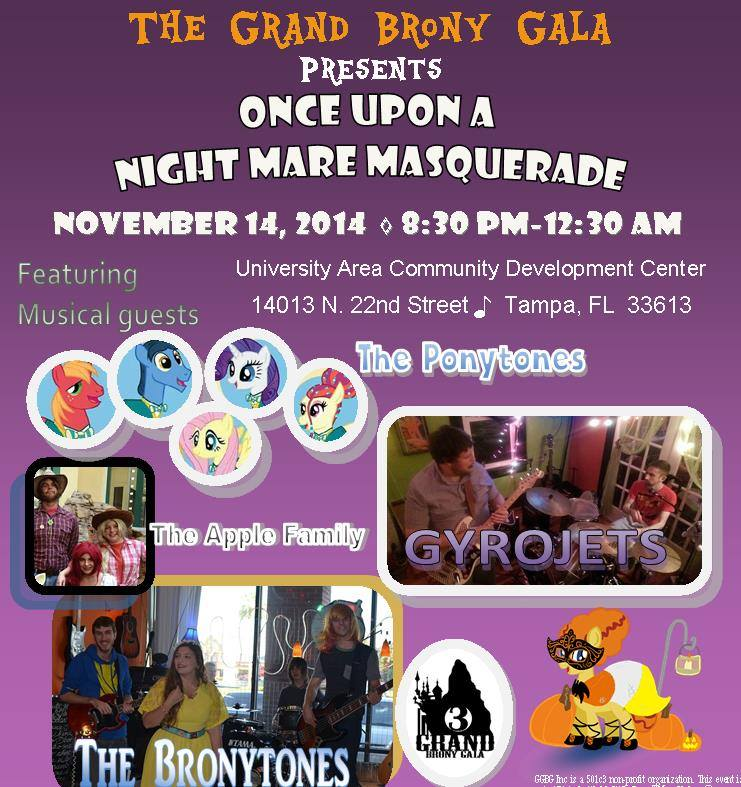 The Grand Brony Gala, the Southeast’s premiere My Little Pony-themed convention, is excited to announce the second annual Once Upon A Night Mare Masquerade, the Tampa Bay region’s most thrilling fall event for fans and friends of My Little Pony: Friendship is Magic! Join us on Friday, November 14th from 8:30 pm to 12:30 a.m. at the University Area Community Development Center for a lively evening of music, dancing and more! There will be a live DJ spinning tunes, live performances by The Gyrojets and The Bronytones, and special guest appearances by The Grand Brony Gala’s own The Apple Family and The Ponytones. In addition, there be raffles for prizes, a silent auction that includes autographed items from cast members of My Little Pony: Friendship Is Magic and The Walking Dead, as well as food, a vendor hall and even more surprises. Plus, before the evening is over, expect a big announcement about Grand Brony Gala 3, coming in July 2015! The Masquerade is a semi-formal-attire event, dress code will be, at a minimum, a button up shirt and slacks, or a skirt or dress. Family-friendly costumes and cosplay are also strongly encouraged! The Grand Brony Gala is the Southeast’s premiere My Little Pony-themed convention. Now entering its third year, it brings together fans (affectionately known as “Bronies” and “Pegasisters”) of the television show My Little Pony: Friendship Is Magic from all over the nation. For three days and nights, they celebrate the positive messages the show teaches, and the creative community it has encouraged around the world. 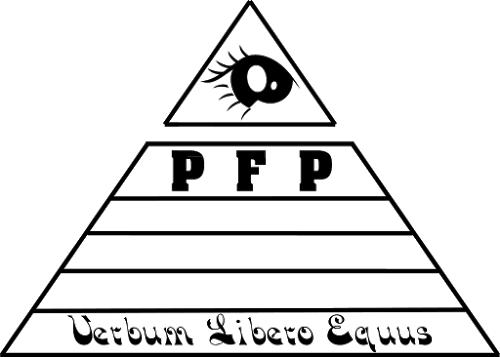 The convention itself is also a fundraiser, with all profits going to benefit All Children’s Hospital in St. Petersburg, FL. Grand Brony Gala 3 will be held July 10-12, 2015 at the Embassy Suites USF/Busch Gardens Hotel in Tampa, Florida. Tickets will go on sale shortly. Grand Brony Gala is a trademark of GGBG Inc.
> I’m concerned about whether any material I provide you would be handled respectfully, or even simply reported in just a straightforward manner – posted as is without a snarky commentary. Well his concern was justified. Kek. No, fgt. They did just like he asked: posted it as is without distorting it with any commentary. He did this to himself. Wow. Tried a bit too hard on that one. Dude, this is Horse News. We used to just let our press releases loose here and roll with it. If you don't act like a bladder you won't have the piss extracted. What a very nice introduction and I find your responses to be rather ... what is that word... sophomoric. No, not quite appropriate, perhaps puerile is a bit better. However, I suspect that is much too big a word for you. Perhaps I should just act like you and call it as I see it ... you are acting like a middle schooler. Having been at this con last August, I can say there is an anti-Horse News slant there. After all, there was no one at the Horse News panel on Saturday (I know because I had the panel next door). I mean, they obviously slandered it, because nobody I know would resist going had they known Crazy "Luscious Locks" Ivan would be there. Also, getting mad at Horse News for being "sarcastic and aggressive" is like getting mad at alligators for having teeth. This new PR guy better shape up before the spaghetti lords use his organs to make their meatballs. So what exactly is so wrong with this? 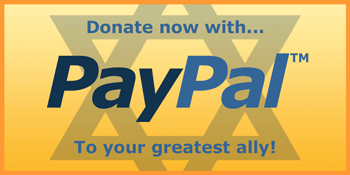 You mean an organization with a history of anti-Semitism, Hitler promotion, support of Rule 34, and general nastiness for the sake of nothing is suspect? Honestly, H-N has become less edgy, but there is history.